The Dean of the School of Leadership, Science and Technology will provide strategic academic leadership for the departments of Business, Management and Leadership, Communication and Sport Studies, Mathematics, Science and Technology, and Veterinary Technology. The successful candidate will have a demonstrated record of innovation and exemplary leadership in the areas of new and evolving pedagogies, civic engagement, global and diverse educational programming, and high impact practices. A commitment to the Boyer model of scholarship is a pre-requisite for this position, as is a commitment to the use of technology in the classroom. This position requires a leadership style that exhibits creativity, flexibility, collegiality, and a support for shared governance. Additional expectations of this position include maintaining an active presence in the internal and external communities, and working collaboratively various offices and programs to ensure a culturally and intellectually enriching student-centered environment. Works closely with members of the Academic Council as part of the central team for academic planning. Leads the department chairs in the development of attractive, contemporary major programs. Maintains effective and ongoing communication with Department Chairs and Program Directors on College matters. Works with the Admissions to recruit qualified students in sufficient numbers for continued growth. Coordinates retention efforts with various administrators and professional staff members. Insures for students an effective first-year experience and a general education program of high quality. Plays an integral role in the intellectual/social life of the campus, especially among students. Addresses student appeals—grades, academic dishonesty, probation, suspension, and program or College dismissal. Oversees activities related to the ongoing operation of the Office of the Deans. Participates in the evaluation of full-time faculty and courses within the School. Oversees course scheduling and staffing in collaboration with the Registrar, Academic Advising, Chairs, and other administrators. Serves as ex officio member of faculty committees, such as Curriculum, Academic Standards, and Educational Technology. Assists in the annual editing and updating of academic portions of the graduate and undergraduate catalogs and other similar publications. Represents the School to external audiences, including alumni and community organizations. Teaches up to one course annually, as needed. Performs other duties as directed by the Vice President for Academic Affairs. Must have a Ph.D. or a terminal degree from an accredited institution. Must have achieved faculty rank of associate professor or higher with a record of teaching excellence commensurate with rank. Previous administrative experience such as dean, department chair or program director with a proven record of collaborative and collegial leadership. Commitment to the liberal arts and professional programs, as well as experience with diverse modes of course delivery for both the traditional undergraduate and post-traditional student populations. 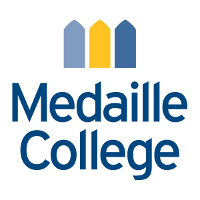 Resume with cover letter and three contact references should be electronically submitted to Barbara Bilotta, Director of Human Resources, Medaille College. Review of applications will continue until position is filled. No phone calls please.